Hace 65 millones de años un enorme asteroide 10 km diámetro impacto en este lugar, ocacionando un cataclismo mundial, acabando con el 60% de los seres vivientes estelarmente los dinosaurios dando lugar al surgimiento de los mamíferos. 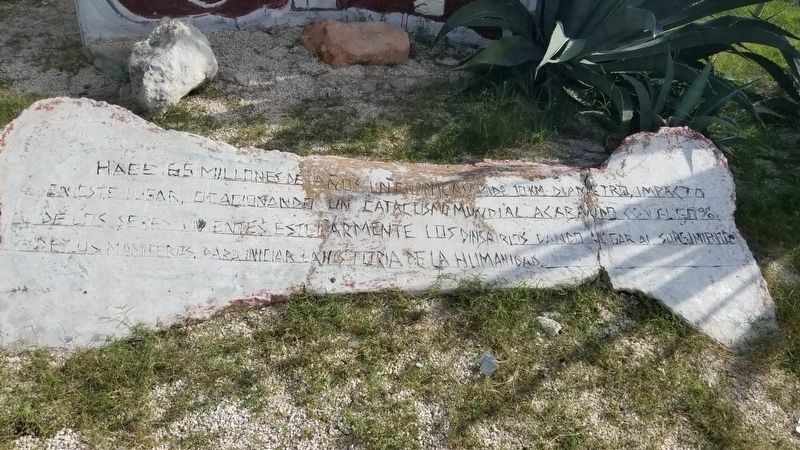 Daba iniciar la historia de la humanidad. 65 million years ago a huge asteroid 10 km in diameter impacted here in this place, causing a worldwide cataclysm, destroying 60% of the living beings on the planet. This event most famously eliminated the dinosaurs and prepared the way for the emergence of mammals. This was the beginning of the history of humanity. Location. 21° 17.659′ N, 89° 36.432′ W. Marker is in Chicxulub Puerto, Yucatán, in Municipality of Progreso. Marker is on Calle 20 just north of Calle 21, on the right when traveling north. Touch for map. Marker is in this post office area: Chicxulub Puerto, Yucatán 97330, Mexico. Touch for directions. 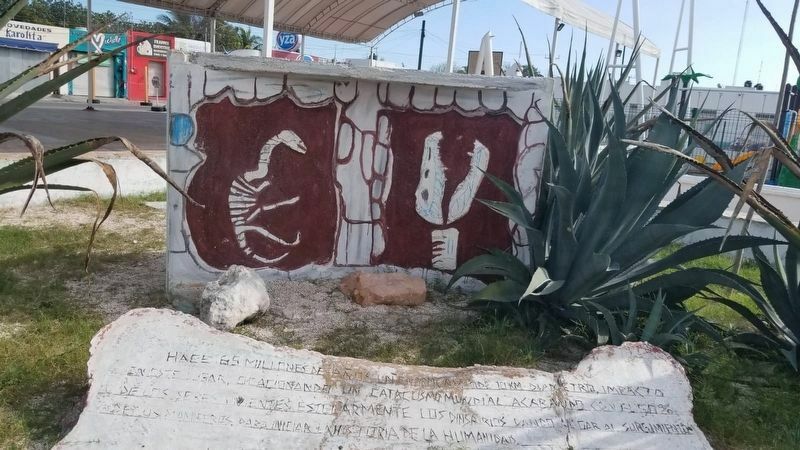 The marker is at the base of a modest piece of concrete artwork depicting the skeletons of various dinosaurs. (approx. 5.9 kilometers away); Heroes of Chapultepec and Veracruz (approx. 5.9 kilometers away); Dzibilchaltún Archaeological Site (approx. 22.5 kilometers away); Substructure 38 (approx. 22.6 kilometers away); Structure 36 (approx. 22.6 kilometers away); Sacbe 1 (approx. 22.6 kilometers away); The Open Chapel (approx. 22.6 kilometers away). More. Search the internet for Chicxulub Asteroid Impact. Credits. This page was last revised on March 3, 2019. This page originally submitted on March 3, 2019, by J. Makali Bruton of Querétaro, Mexico. This page has been viewed 45 times since then. Photos: 1, 2. submitted on March 3, 2019, by J. Makali Bruton of Querétaro, Mexico.